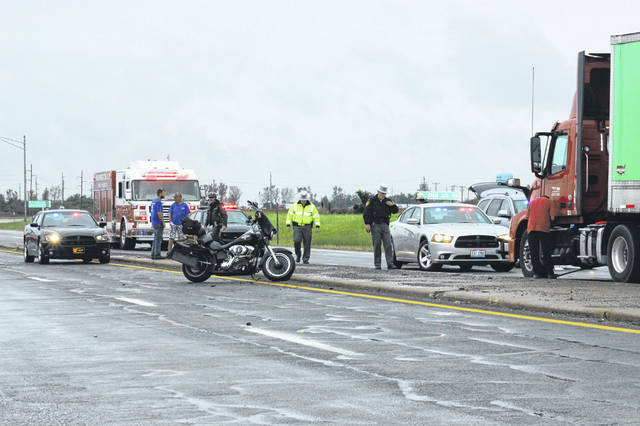 Authorities cleared the scene following a motorcycle/semi-truck accident at the intersection of State Route 753 and the U.S. 35 westbound exit ramp in Union Township. A Springfield man died at the hospital from injuries he suffered. A 51-year-old Springfield man died from injuries sustained in a motorcycle/semi-truck accident that occurred Wednesday afternoon at the intersection of State Route 753 and the U.S. 35 westbound exit ramp in Fayette County. At about 1:30 p.m., William Paxson was riding a 2010 Harley-Davidson motorcycle and was exiting westbound U.S. 35 onto State Route 753, according to Fayette County Sheriff Vernon Stanforth. When the motorcycle approached the stop sign, Paxson was unable to stop due to the roadway being rain-covered at the time. The motorcycle failed to stop at the stop sign and continued onto State Route 753 into the path of a 2017 Volvo semi-tractor with trailer, driven by LeManuel Wright, of Reynoldsburg. Both vehicles sustained disabling damage, according to Stanforth, and were towed from the scene. Paxson was transported by Fayette County EMS to Fayette County Memorial Hospital where he succumbed to his injuries, Stanforth said. Wright said he had no injuries and remained at the scene. The FCSO, Sheriff’s Response Team, Fayette County EMS and Washington C.H. Fire Department responded to the scene. Northbound lanes of State Route 753 were closed a short time to conduct the crash investigation, Stanforth said. https://www.recordherald.com/wp-content/uploads/sites/27/2018/10/web1_IMG_7123.jpgAuthorities cleared the scene following a motorcycle/semi-truck accident at the intersection of State Route 753 and the U.S. 35 westbound exit ramp in Union Township. A Springfield man died at the hospital from injuries he suffered.